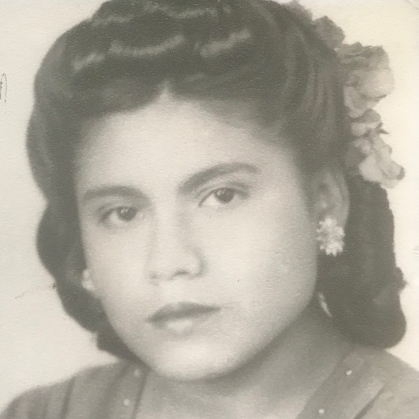 Celsa Espinosa Montelongo, age 86, peacefully went home surrounded by her loving family on April, 5, 2019 in San Antonio, TX. She was born in Cerritos, SLP, Mexico on July, 28, 1932. Celsa is preceded in death by her husband, Silverio P. Montelongo of 68 years, two daughters Maria and Elizabeth, two sons, James and Silverio, Jr., and one granddaughter, Christine. She was a member of Templo Elim Assemblies of God and a homemaker. She enjoyed crocheting, gardening, and spending time with her grandchildren and great grandchildren. Celsa is survived by sons, Vincent, Roy, Ray, and daughter Mary, seven grandkids, Sandy, Corina, Priscilla W., Priscilla C., Mark, Monica, and James, nine great grandkids, Monique, Natalie, Marisol, Joshua, Jadyn, Aubrey, Drake, Micah, and Gianna, and one great great grandchild, Jypsy. A visitation will be held from 5:00 p.m. to 8:00 p.m. on Tuesday, April 9, 2019 at Corpus Christi Funeral Home. A prayer service will be held at 6:00 p.m. that same evening. A Funeral service will be held at 1:00 p.m. on Wednesday, April 10, 2019, at Templo Elim followed by a funeral procession to Rose Hill Cemetery.